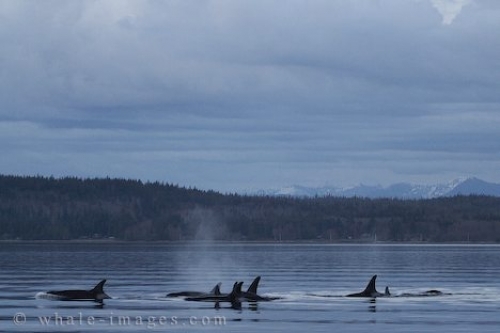 This mystic photo of Offshore Killer Whales was photographed on a cold winter day close to Port McNeill on Northern Vancouver Island. On March 23, 2004 we got a call that possible offshore Killer Whales were close to shore and we were asked to confirm this with ID shots. Unfortunately we could not get a lot of IDÂ´s because it got dark fast, but we got enough to confirm that it was a group of Offshore Killer Whales - a very exciting whale watching experience! Picture of a group of offshore Killer Whales, outside of Port McNeill on Northern Vancouver Island, British Columbia, Canada.